Provide comfort for the family of Jon Driessen with a meaningful gesture of sympathy. 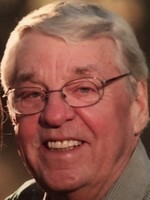 Jon Joseph Driessen, 79, died peacefully at home March 29, 2019, surrounded by his loving family. Born in Coeur d’Alene, Idaho, to Joseph (Joe) and Verna Driessen, Jon was a product of the Great American Dream. From his father, a carpenter, and his mother, a schoolteacher, Jon believed in hard work and education to get ahead in life. From those Coeur d’Alene (CDA) roots of family and life-long friendships, Jon cultivated a love for people, the outdoors, and sharing of stories. Growing up in Coeur d’Alene, he spent time swimming in the lake, hunting the mountains, fishing in the creeks, playing sports with his friends, and caddying at the Hayden Lake Country Club for the likes of Bing and Bob Crosby. He lettered in baseball and football and spent two summers working as a dishwasher at West Glacier, Montana. During his senior year Jon met sophomore Karen Chestnutt at a Halloween dance. Their first date kindled a rare and remarkable 63 year journey of friendship, marriage, and family. According to Jon, it was Karen who sparked and inspired Jon’s intellectual professional life. After high school graduation in 1957, Jon earned his BA in Sociology in 1961 from Eastern Washington State College (EWU) and a commission in the US Army. Jon and Karen married two months later and embarked on two years of service in the Army Medical Service Corps stationed in San Antonio, Texas, and Ft. Riley Kansas. Daughter Renee was born three months before the Cuban Missile Crisis, as Jon’s unit was loaded on boxcars ready to be the first medical battalion sent to Cuba. Thankfully nothing came to pass. In 1963 Jon was honorably discharged from the Army as a 1st Lt., where upon he earned a MA in Sociology from Montana State University (UM) in 1965 and a PhD in Sociology from the University of Colorado in 1968. By then Karen had completed her BA at Montana, a MA at Denver University, and together they had added son Eric to the family. Jon joined The University of Montana in January 1969 as Assistant Director of the Institute for Social Science Research and member of the Department of Sociology. Later he became an adjunct Professor of Linguistics and a Faculty Affiliate with the Missoula Technology and Development Center of the United States Forest Service. After 32 years of service to UM, Jon retired as Sociology/Linguistics Professor Emeritus. Jon’s career focus was qualitative sociology. His research was varied, but always exemplified the best of both practical and theoretical work. For ten years Jon was editor of the International Sociological Association’s Sociolinguistics Newsletter, and in conjunction, presented research papers in Uppsala, Sweden, Kassel, Germany, and Mexico City. His research projects ranged from a major study of the Western Montana Catholic Diocese after Vatican II, to consulting for Cascade Airways, and a long series of projects with the U.S. Forest Service spanning nearly thirty years. Contributions to the Forest Service focused on safety and occupational health projects, including wild land fire fighting. He received two national awards for developing training materials based on his ethnographic studies of Forest Service work culture. Although his professional life filled much of his time, Jon’s personal interests included golfing, fishing and hunting. After many years of a shared family home in CDA on the Spokane river, Jon was able to fulfill his long-time dream for a retreat in St. Regis, Montana where he hunted and fished. Upon retirement Jon and Karen built their bunkhouse on the banks of the Clark Fork River. Jon is survived by his wife Karen; daughter Renee Driessen (Randy Fuhrmann); son Eric Driessen (Eddi); grand daughter Rose Hedrick; grandson Randall Jex (Lizzi); great grandsons, Kaleo and Kai Jex; sister Katherine L. Ulbricht; nephew Michael Ulbricht; neice Heidi Ulbricht (Brad Wright), their children Molly & Ben; brother-in-law Mark M. Chestnutt (Jeanie), children Steven & Kurt; and great nieces & nephews. Preceding him in death are his parents, Joe and Verna Driessen, brother-in-law Roger Ulbricht, sister-in-law Shirley Chestnutt , and nephew Scott Chestnutt. Jon believed his memory would live on through his family, friends, students, and their shared stories. Because of his own love of stories and people, Jon became the glue for many diverse relationships. His stories were often humor-based and he loved to play with words, tell stories, and laugh. Though his health was compromised in the last five years by back surgeries, stroke and the final Myelofibrosis diagnosis, he never lost his humor. He believed he had a good life. A Celebration of Life and Reception will be held at 11:30 a.m., April 6, 2019 at Garden City Funeral Home, Missoula. In lieu of flowers the family suggests memorial donations to Montana Public Radio, Montana PBS, the Clark Fork Coalition, or The University of Montana in support of scholarships. To send flowers in memory of Jon Driessen, please visit our Heartfelt Sympathies Store. Provide comfort for the family of Jon Driessen by sending flowers. Hal and I remember a great professor, jovial friend, terrific father of a couple favorite Sentinel students, good golfer, and a good guy. We’re Down Under - not back in time for service. Condolences and good wishes.